Case Study: Design Solutions. Think Success. Have you ever had a project so big and/or complex that you did not know where to start? You’re not alone; it’s happened to all of us. This session describes how one employee used the design thinking approach to make the seemingly impossible possible. This case study provides insight into an example that engaged the creativity of peers as well as identified solutions that were both effective and efficient. How design thinking improves the training development process. Recognize ways to utilize multiple resources to resolve a training issue. Estimate possible benefits/outcomes when you apply design thinking to training development. Kendra Lester attained a master’s degree in industrial-organizational psychology and immediately began working in her field. Kendra worked in the government sector, with a focus on training development and cognitive tasks analyses. After a short while doing so, she realized that government contracting was not right for her. 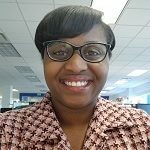 Soon after this realization, Kendra began working at JetBlue University applying many of the skills she acquired during her studies and previous employment.